This was delicious, but the top and bottom crusts were both doughy and soggy. I bought the pie on a humid morning at the Green City Market, and then left it in the box, in the car which was parked indoors, and didn't eat it until about 12 hours after purchase. Not sure what the culprit was, but as tasty as this pie was, it wasn't exemplary. Another note: the pie was packed in a pizza box which, strangely, had a distinct pizza aroma when I opened it. Power of suggestion, or do they re-use pizza boxes from somewhere? Kennyz wrote: This was delicious, but the top and bottom crusts were both doughy and soggy. I bought the pie on a humid morning at the Green City Market, and then left it in the box, in the car which was parked indoors, and didn't eat it until about 12 hours after purchase. Not sure what the culprit was, but as tasty as this pie was, it wasn't exemplary. Kenny - For shizzle, you sogged up your pie by letting it sit in the car all day. Also, no offense to the GCM or any market, but I'm done buying pastry there. Between the transit from the bakery to the market and the sitting out in the hot sun, it just doesn't work for me. Go to the store, Hoosier Mama, on Chicago, have the same piece of pie, then post again. If you're not pleased with the peach, try something else; maybe the peach isn't for you. But, IMHO, stay away from market pies. Big difference in quality. No offense to the GCM, but I'm done buying pastry there. Between the transit from the bakery to the market and the sitting out in the hot sun, it just doesn't work for me. Go to the store, Hoosier Mama, on Chicago, have the same piece of pie, then post again. If you're not pleased with the peach, try something else; maybe the peach isn't for you. But, IMHO, stay away from market pies. Big difference in quality. I should have been clearer: I have had other Hoosier Mama pies, and they have been incredible every time. This was the first not-so-incredible one. It sounds like your pie might have gotten sweaty. 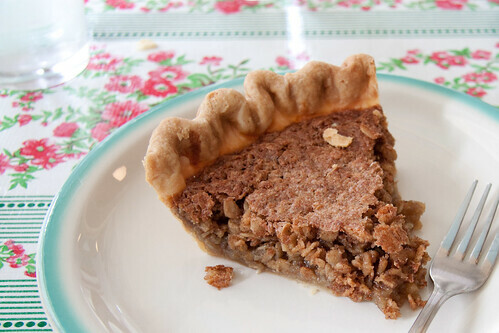 At the shop is always preferred but my experience is that the pecan pies sold at the GCM hold up very well. I do suspect that my storage and transport issue was the main culprit, though the center of the pie did look and taste underbaked to me. "I bought the pie first thing in the morning, left it in the car for 12 hours, on a humid day, in a no parking zone, retrieved it after the long weekend from where it was towed to, microwaved it for a couple of minutes, and it was inedible. That is the last time I ever buy pie from this place!" I took my daughter there a couple of weeks ago. I had the lemon chess, she had the chocolate pudding. They were both exemplary. The person working there was super nice, and even let my daughter try a couple of bites of different pies before she found one she liked. Then she gave her two flowers to take home with her (along with the slice of chocolate chess pie for my wife). Vitesse - who are you quoting in your post? For the record, it was 74 degrees yesterday, and the major humdity existed just in the morning when I bought the pie. The car was parked in a completely indoor lot attached to an air conditioned high rise building. There was no nuking, and I ate a piece of pie after it had sat in what I thought was essentially room temperature for about 12 hours. I will likely buy many more Hoosier Mama pies, though I may examine them more closely to make sure they don't appear underbaked. Kennyz wrote: I do suspect that my storage and transport issue was the main culprit, though the center of the pie did look and taste underbaked to me. I have to admit that I thought your post was a satire of some earlier criticisms about the place and it wasn't until your follow-ups that I realized you were being serious. All this begs the question: what about your pizza box comment? Were you serious about it smelling like pizza? I was actually serious about it all. I did think my storage contributed to the problem, but to be honest the storage doesn't seem much different to me than keeping it on the counter at home, so I'm not sure. Maybe the peach pie is just wetter than other pies, maybe this pie was underbaked, maybe the humid morning did it. I dunno. And yes, I really did think it smelled like a pizza when I opened the box, believe it or not. Kennyz wrote: believe it or not. Kenny, my friend, I have no reason to ever doubt you. The only question here was whether you were being serious or not. That said, I cannot believe that HMPC is using reclaimed pizza boxes, so I'm at a loss to even try to explain this. Maybe they are getting the boxes from a pizza place and not directly from the manufacturer or distributor. If they sit around a pizza shop for some amount of time before they make their way over to HMPC, that might be the reason. In my experience with these pies, I've never encountered this issue and I actually think the pizza box is a very cute concept. Whoever suggested the sugar cream pie, thank you!! I had gone to Hoosier Mama before and liked the pie but I didn't LOVE the pie (especially at the price). But I thought I'd give it another shot and picked up a savory pie --the pork, apple, and sage-for brunch tomorrow and a sweet pie which we ate yesterday and finished tonight. The sugar cream was great. Not too sweet, nice crumbly crust, and with a healthy blast of whipped cream it was just fantastic. I'll let you know later about the savory pie, but the sugar cream was a home run. My only regret was that I bought the mini and not the full sized one. groovedirk wrote: The sugar cream was great. Not too sweet, nice crumbly crust, and with a healthy blast of whipped cream it was just fantastic. I'll let you know later about the savory pie, but the sugar cream was a home run. My only regret was that I bought the mini and not the full sized one. Believe me, I wish I had one in front of me right now -- mini or full! I've loved every pie I've had from there. I personally think the peach pie is heaven. It was perfect when I had it - not the least big soggy. 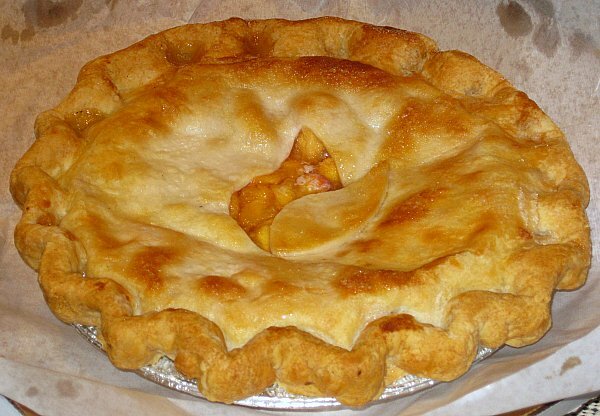 I also have to say, that generally I am not a big fruit pie fan, but I have really enjoyed their apple and peach pies. Want to try their savory pies though - which are the best? A nice bit of coverage by Serious Eats. Unfortunately they appear to have misspelled Paula's name ("Hamey"). This was delicious, but the top and bottom crusts were both doughy and soggy. Not sure what the culprit was, but as tasty as this pie was, it wasn't exemplary. I wanted to love this pie. I didn't. It was okay. I picked up a mini apple pie from Green City today. Apple pie is a favorite of mine. I expected it would be as wonderful as the apple pie from Fox & Obel. It wasn't. The top crust, unlike Kenny's, seemed nicely done but the bottom was spot on like Kenny's description. It wasn't hot today and I left the pie on my counter. I'm greatly dismayed. I guess I will try a slice from the shop. Just realized I never posted about the savory pie I bought--the Pork, Apple and Sage one. It was very good. It was awfully crumbly (i.e. messy) and didn't hold together terribly well but it was mighty tasty with the pork sausage having a nice flavor. I would definitely get it again though it isn't in the "GOTTA HAVE IT" category (reserved for things like NN Smokehouse's Beef Ribs, Silver Seafood's fried Lobster, Jamaican Meat Patties on Howard and several other bits). Too bad they are closed today. I'd go get one of those sugar cream pies. Maybe I'll finally make the trip way down to the Sweet Potato Pie place. This past Saturday I met happy_stomach and BryanZ at Hoosier Mama to start the South Side Saturday ride (yes, HPMC is not on the South Side, but it's delicious and a convenient meeting point). Had a new-to-me pie, oatmeal. Think pecan pie with oats instead of pecans. dansch wrote: This past Saturday I met happy_stomach and BryanZ at Hoosier Mama to start the South Side Saturday ride (yes, HPMC is not on the South Side, but it's delicious and a convenient meeting point). Had a new-to-me pie, oatmeal. Weird. It's the same pie we got with our Food subscription from First Slice this week. I'm from South Carolina and never heard of this pie or its history before. pairs4life wrote: Weird. It's the same pie we got with our Food subscription from First Slice this week. I was just over by First Slice today (had lunch at Beans and Bagels) and *almost* stopped by for some pie. If only I had, I could have compared their oatmeal pie offerings. I'm a big oatmeal fan - I eat it M-F for second breakfast*, almost without fail - and the oatmeal pie totally did it for me. * Yes, I eat two breakfasts - once before I leave my house and then again when I get to my office. I'm hungry, ok? Finally got a chance to try Hoosier Mama on Saturday. I had another perfect sausage pizza at Coalfire and my nephew reminded me that Hoosier Mama was close by. I'm a huge chocolate cream pie fan, but sadly they were out of it when we got there. However, they had one slice of chocolate chess pie left so I took it. It was amazing! One of the best pie's I've ever had. It was like a brownie pie. We went back there on Monday on our way home from Michigan, only to see the dreaded Closed sign. Monday is a tough day for food lovers! So many places are closed. Looking forward to more pies from here. Ram4 wrote: We went back there on Monday on our way home from Michigan, only to see the dreaded Closed sign. Monday is a tough day for food lovers! So many places are closed. Looking forward to more pies from here. My wife had a slice of something they called "Vinegar Chess," and it was oustanding. A sweet/tart vanilla flavored filling. I had one of their scones, which are at least as good as the pies. 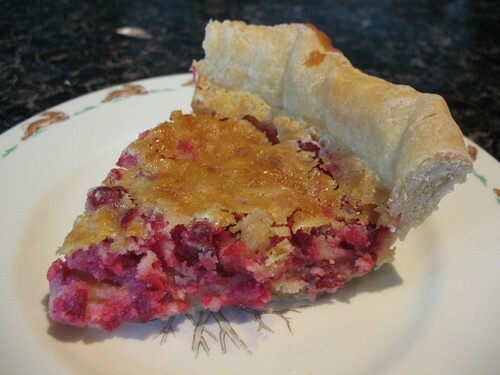 I wanted to like this pie as I've been playing around a lot with cranberries lately, but it didn't quite work for me. The cranberry flavor was very subtle, and the filling as a whole had the consistency of stuffing, soft but pretty chunky. I double checked that the filling was made with cornmeal rather than flour because it seemed so bready. I would have liked more tartness and a consistency closer to bread pudding. Nevertheless, I'm very excited about all of the fall pies. I'll be far from Hoosier Mama for Thanksgiving this year, but I fully intend to place my order for apple-quince and pumpkin-ginger pies so that I can indulge in advance of the holiday. I recently had the opportunity to try the apple, chocolate chess, chocolate cream, and banana cream pies from Hoosier Mama (That's a lot of pie, I know.) I have to say that except for the crust of the apple pie I was pretty disappointed overall. The chocolate cream was very heavy and uninspiring; I stopped eating after a few bites. The coconut cream was just a vanilla pastry cream with shredded coconut in/under it, not really giving a full coconut taste. The apple pie crust, however, was wonderfully flaky and buttery. Every other crust was very pale and underbaked, lacking the awesomeness of the apple one. This may be because for cream pies crusts are blind baked, then filled. Anyway, as a pie snob, I've tried Hoosier Mama, and now unless I'm in the mood for something unique, like vinegar chess, I'll stick to making my own. grace21 wrote: Every other crust was very pale and underbaked. . . I've noticed this as well lately. I'm not saying that there's a downhill alert, but the last few pies I've had from there weren't "great," and the biggest fault, IMO, was that the crusts were too pale. Oh pie, oh pie, oh pie... I really did not want to be the one to say this. In fact, I've been in denial, my pie consumption unabated, dismissing dud pie after dud pie from the last few weeks in the back of my mind. It could not be possible that *I* would need to sound a downhill alert for my beloved Hoosier Mama Pie Company, but now I feel I must, however meekly. I held off on sounding the alert mainly because I have had to cut back on pie crust, so even though I have maintained my average of 3-4 slices of HMPC pie per week, I actually haven't been partaking in whole pie. I have had very few bites of crust here and there, but I've mainly had to (gasp!) dispose of my crust or give it to fellow pie-eaters. I've noted that the crusts have looked uniformly pale and underbaked (and tasted so when I've eaten it). Fellow pie-eaters have agreed. However, and I know this is going to sound crazy, feeling deeply bitter and cursed about newly having to avoid pie crust, I saw the decline in HMPC crust as the world showing me a little mercy, benevolence even--I wasn't going to be able to eat crust, but it wouldn't really matter as the crust sucked now anyway. As I said, craziness. What I can, however, speak to confidently (and perhaps sanely) is pie filling, and in this I've been disappointed more times in the last few weeks than I've been in all of the 7 or so months that I've been eating HMPC pie in a dedicated way. The vanilla cream being used in the coconut cream pie that grace 21 mentioned and also the banana cream, raspberry cream and perhaps other pies I'm forgetting has struck me again and again as out of place as open pie filling. It belongs in enclosed pastry, a pastry that is about vanilla primarily. It tasted wrong with large pieces of banana--simply too much vanilla. That pie was also was supposed to be banana cream, and I couldn't discern any banana in the cream besides the pieces. It didn't help in that particular pie that the bananas tasted not quite ripe, which baffled me. This was a totally different pie than the first banana cream I had from the shop, which I remember very clearly and fondly. 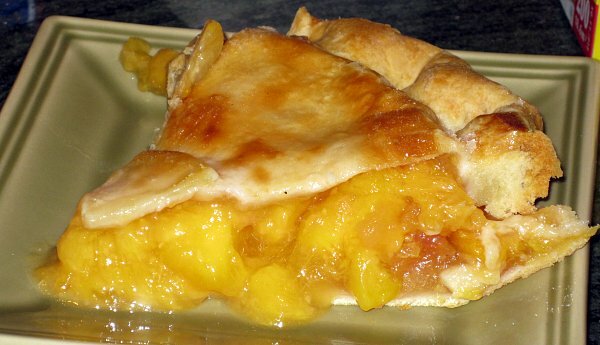 I've also noticed a clear decline in fruit pies, particularly in the very beginning of fall with the ones containing peach--tasteless peaches. However, I've tried to forget these disappointments especially since the pear pies recently, crust aside, have been quite yummy--the fruit sweet and cooked perfectly. I haven't noticed much decline in the filling of the chess pies except that the chocolate has seemed increasingly removed from the crust in the last few of that pie variety I've purchased. I like very much that the chocolate chess is basically a brownie with pie crust, but I think these two elements could be better integrated so that it doesn't seem like a round brownie just laid in an ill-fitted crust. Perhaps a fix for what I've observed is simply more filling. The savory pies as far as I can tell are as good as ever, though just for sake of variety I've been mixing up my savory pastry more frequently these days with quiches from Floriole. That said, a new HMPC pork-apple-sage pie is sitting in my refrigerator right now, and it looks delicious. I welcome any and all challenges to my downhill alert. Let me be clear: I stand fully behind HMPC and am hopeful for a turnaround in the near future. For better or worse, I don't live close enough to Hoosier Mama to go there nearly as often as I would like, but I was in there the other day and had a piece of Hoosier Sugar Cream Pie. The crust on this pie couldn't have been better. Rich and buttery...almost like a cookie; yet delicate enough to let light pass through. I'm not sure how this crust could have been improved. The light spot the red arrow is pointing to is not an under-baked section of crust, but rather the light filtering through. Granted, this is a different crust than that used on the fruit pies, but considering that no more than six months ago every pie was being hand made by one person, Hoosier Mama's expansion has been phenomenal. It sounds like they may be going through a temporary quality control problem. Maybe they are baking so many pies that they are hurrying their time in the oven. Maybe new bakers are being trained. Maybe it's any of 1,000 other reasons. In any event, my guess is that a person who takes as much pride in her product as Paula Haney will no doubt work through this issue in short order. Well, I'm no spokesman for Hoosier Mama but having just been shooting there, I can answer a few of the questions based on my interviews and observations... they have rapidly grown from 2 people working there to 10, most of whom are bakers and all of whom trade off the different parts of baking. So on the one hand, there's some human variation, and on the other, sheesh, they're all working there within a few feet of each other, Paula included, in very tight quarters. So I don't think anybody's unaware of what anybody else is putting out, and certainly on my observations, they're all extremely capable pie bakers, making adjustments intuitively and working far faster than a proficient home pie maker like me can. As far as other things go, gee, I think peaches were fairly mediocre in the farmer's markets until the last few weeks of them, so if Hoosier Mama's reflected that, that's the price of buying local, I guess. I can't really speak to the cream pies because that's not my thing in fruit season (although I agree that it's somehow wrong that the lemon meringue pie really tastes like lemons, not like fake lemon flavoring like a real lemon meringue pie— or perhaps I should say, a Realemon® meringue pie— tastes). 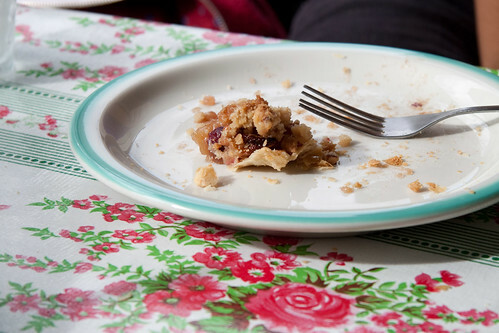 Anyway, for my part on the subject of possible decline, in the last month or two I've had at least four things— the sugar cream pie, the pork apple sage savory pie, the oatmeal pie and the apple pie— which could easily have gone in the Best Things I've Eaten Lately thread. Anyway, as for the growth issue, it's readily apparent just by visiting the shop. There's a flurry of baking in those tight quarters, as you say. I hope they can adjust and have confidence they will.